Medresi Dran is a Dunmer citizen found in Angarvunde. 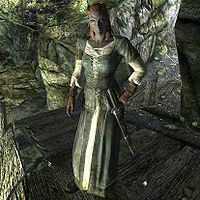 Frustrated that her team of excavators fled after stumbling upon draugr in the ruins, she offers to split the treasure inside if you will open the way to it, beginning a miscellaneous quest. Upon the gates being open, Medresi sprints ahead to steal the treasure for herself, only to be crushed by an ingenious trap. Medresi Dran wears a set of clothes along with a pair of gloves and leather boots. She also carries a steel dagger and three potions of minor healing.